HALIFAX, NS – The Atlantic Canada Beer Blog reports that a new social organization aiming to expand the interest in craft beer among women is launching this week in Halifax. 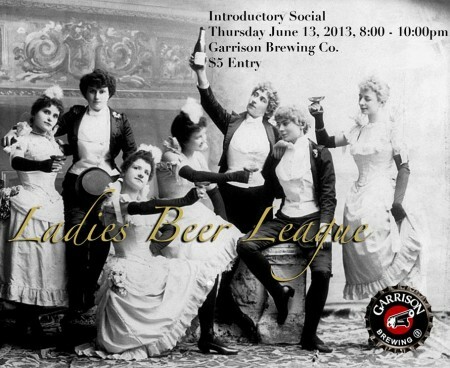 The Ladies Beer League is being initiated by several female employees of Garrison Brewing, including Kellye Robertson and Tracy Phillippi, and the group’s first monthly gathering will take place at Garrison on Thursday July 13th from 8:00 to 10:00 PM. Admission to the event is $5, and attendees will enjoy a special cask edition of Garrison’s Nit-Wit Belgian Witbier, fermented with elderberry and bilberry juice and local honey. LBL gatherings will take place on the second Thursday of every month, with future event partners set to include other local breweries such as Propeller Brewing and Bridge Brewing, as well as the four private beer stores in the Halifax area. For more details, see the Ladies Beer League Facebook page.